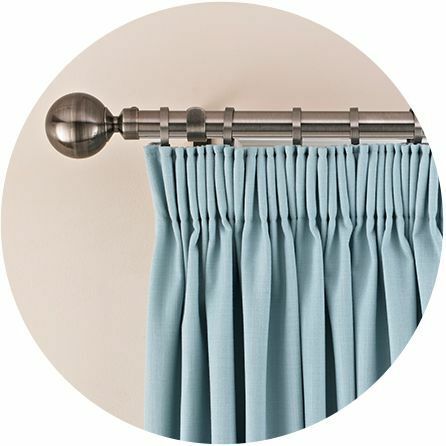 Bring a touch of glamour to your interior with made-to-measure silver curtains from our range. Silver curtains are fabulous for adding a touch of luxury and sophistication to your décor. Our stunning collection includes textured plains and gorgeous prints in a range of classic and contemporary designs. For an elegant finish in a period property, pick out traditional damask prints or romantic florals and embroidered leaf motifs. And for an opulent alternative to grey, choose contemporary geometrics, subtle ombre and textured plains in shimmering silver hues. 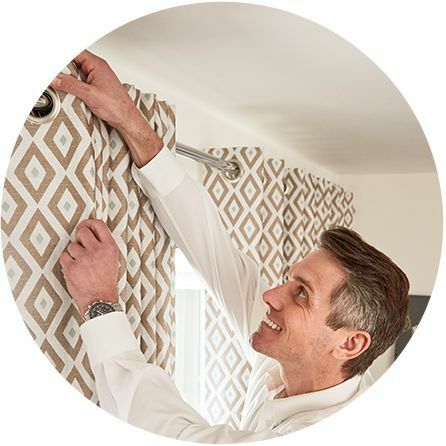 Request an in-home appointment with an advisor and choose your perfect curtains in the comfort of your own home. All our curtains are fully lined as standard, but you can also opt for thermal or blackout linings if you wish. We also have a gorgeous range of curtain poles and finials to complement your stunning curtains. As a Hillarys customer you can expert exceptional service from start to finish. Request an in-home appointment for a time that suits you and chat to an expert advisor about your interior ideas. See our fabrics up close and if you’re not sure how a fabric will look at your window, ask your advisor to show you, using our visualisation tool. You advisor will also measure your windows and return to fit your fabulous made-to-measure curtains for a truly luxurious look.